Pumpkin (Cucurbita pepo or Cucurbita maxima) is a variety of squash that is native to North America. While most of us have a favorite pumpkin pie recipe that we pull out during the fall and winter holidays, this versatile bright orange vegetable can be used to make smoothies, baked goods, soups, salads, and more. Pumpkin calories and health benefits make it a nutritious food to consume year round. There are three types of carbohydrate in pumpkin. You'll get 3 grams of dietary fiber in a cup of pumpkin. There are also 2 grams of naturally-occurring sugar in a single serving. The remaining carbs (7 grams) are starch or complex carbohydrates. Pumpkin has a glycemic index (GI) of 75 making it a high glycemic food. As a reference, foods with a GI of 55 or below are considered low glycemic foods. However, pumpkin has a low glycemic load of just 3. Glycemic load takes serving size into account and many nutrition experts feel that it is a more accurate way to consider a food's impact on blood sugar. Because pumpkin has a low glycemic load and because it provides valuable vitamins and minerals, many people who follow a low glycemic diet still include pumpkin in their diets. There is no naturally-occurring fat in fresh pumpkin. Some varieties of canned pumpkin contain added fat. In addition, many pumpkin-flavored foods contain fat. For example, pumpkin pie contains added fat and many pumpkin-flavored baked goods get their soft texture from fat. Pumpkin-spiced coffee drinks, popular during the fall and winter months, often contain fat from the dairy that is used to make them. There are just two grams of protein in a cup of pumpkin. If you are trying to increase your intake of protein, you won't get a significant boost with this vegetable. However, many pumpkin fans add fresh or canned pumpkin to protein smoothies to enjoy the flavor and boost their protein intake. Pumpkin is rich in beta-carotene—a carotenoid or natural pigment—that provides it with its bright orange or yellow color. Beta-carotene is converted into vitamin A in the body, which helps you to maintain healthy skin, teeth, and vision. When you consume a cup of pumpkin, you'll get 87 percent of the recommended daily intake of vitamin A if you follow a 2,000 calorie per day diet. You'll also get 43 percent of your recommended intake of vitamin K, 29 percent of your recommended intake of copper, and 15 percent of your recommended daily intake of vitamin C. You'll also get a healthy boost of magnesium (18 percent), iron (3 grams or 19 percent), and potassium (561 grams or 12 percent). Beta-carotene is an important antioxidant and you'll get a healthy dose of it when you consume pumpkin. Antioxidants help repair oxidative stress and are considered to be protective against certain diseases, including Alzheimer's disease, high blood pressure, heart disease, Parkinson's disease, and rheumatoid arthritis. One large-scale review of scientific research regarding health effects of beta-carotene found that several studies indicated that a higher intake of beta-carotene was related to a significantly lower risk of all-cause mortality. If you're trying to reach or maintain a healthy weight, adding pumpkin to soups or smoothies will help boost the feeling of fullness. 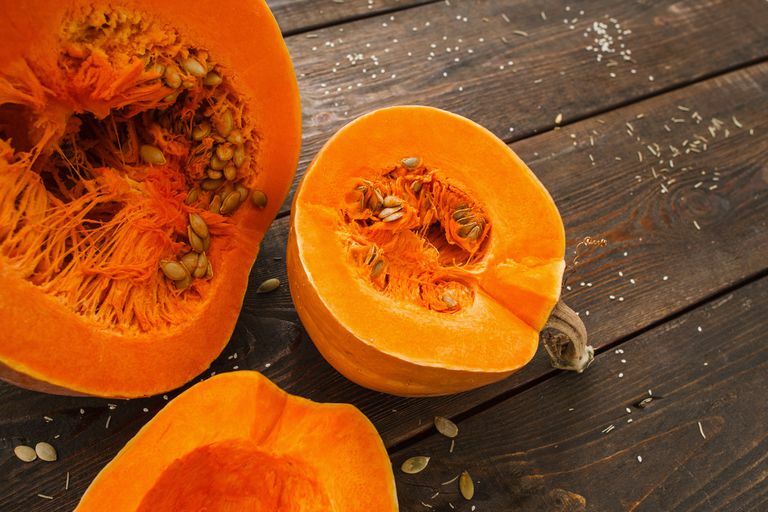 Each cup of pumpkin provides 3 grams of fiber to help you feel full longer. Fiber also helps to boost digestive health. What are the different types of pumpkins? Can all of them be used for cooking? Any pumpkin can be used for cooking, but some varieties are better than others. The large pumpkins that you see in grocery stores around Halloween are best for carving jack-o-lanterns. Pumpkin varieties that are better for cooking include the Small Sugar (or New England Pie) pumpkins and Winter Luxury pumpkins. Buckskin, Chelsey, Dickinson Field and Kentucky Field are often used for commercial canning. How do I choose the best pumpkin at the grocery store? If you plan to cook with your pumpkin, look for those labeled "sweet pumpkin" or "pie pumpkin" they are usually smaller, less watery, and sweeter. Pumpkin shape doesn't matter but choose one with a stem that is 1-2 inches in length to avoid early decay. Is canned pumpkin just as healthy as fresh pumpkin? Some canned pumpkin contains ingredients other than the fresh squash. It's important to read the ingredients list (underneath the Nutrition Facts label) to determine how healthy the product is. Look for canned pumpkin that contains no added sugar, added sodium or added fat. Many times canned pumpkin pie filling contains some of these added ingredients, making it less healthy than fresh pumpkin. But some canned pumpkin contains no added ingredients and is just as healthy as the fresh vegetable—although many cooks still prefer the fresh variety. Cooking pumpkin is easy. Simply remove the stem and split it open with a sharp knife. Remove the pumpkin seeds (and roast them for a delicious and nutritious treat) and cut the flesh into two halves or into large chunks depending on how to plan to prepare it. Rinse well under cold weather. To boil or steam pumpkin, place chunks in a large pot with a few inches of water in the bottom. Cook for 20-30 minutes until tender. To roast pumpkin, place two halves on a baking sheet with the skin facing up (flesh facing down). Bake at 350°F for about an hour until you can pierce the flesh with a fork and it is tender. Lastly, remember that staying fit and healthy in the fall depends—in part—on how you manage Halloween calories. Take reasonable steps to control your candy intake during this festive holiday. According to the American College of Allergy, Asthma, and Immunology pumpkin is not a food usually associated with allergic reactions. However, there have been some cases of pumpkin allergy. Symptoms can occur after carving or eating pumpkin and may include itchy eyes, sneezing, eyelid swelling and chest tightness. It is also possible, but not common, to be allergic to pumpkin seeds, according to published research. If you suspect that you have a pumpkin allergy, speak with your healthcare provider about your symptoms to get a proper diagnosis. Figueredo E, Cuesta-herranz J, Minguez A, et al. Allergy to pumpkin and cross-reactivity to other Cucurbitaceae fruits. J Allergy Clin Immunol. 2000;106(2):402-3. doi: 10.1067/mai.2000.108109. Zhao LG, Zhang QL, Zheng JL, et al. Dietary, circulating beta-carotene and risk of all-cause mortality: a meta-analysis from prospective studies. Sci Rep. 2016;6:26983. doi: 10.1038%2Fsrep26983.